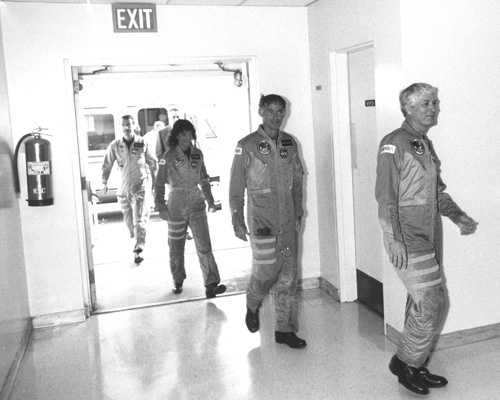 Four members of the crew of Shuttle mission STS-41D return to the Operations & Checkout Building at KSC after the first launch abort in the Shuttle program on June 26, 1984. The automatic engine shutdown occurred when the fuel valve on engine #3 failed to open. Right to left are commander Hank Hartsfield, mission specialists Mike Mullane and Judy Resnik and payload specialist Charlie Walker. Not shown are pilot Mike Coats and mission specialist Steve Hawley. The crew is soaking wet because they were evacuated while the pad deluge system was dousing a hydrogen fire at the base of the stack. I still can't believe they used to launch these guys in shirt-sleeves. I just love this photo. It means so much more having read Riding Rockets by STS-41D crew member Mike Mullane. "I thought we'd be much higher at MECO." What a fantastic book it is too, I really enjoyed it.